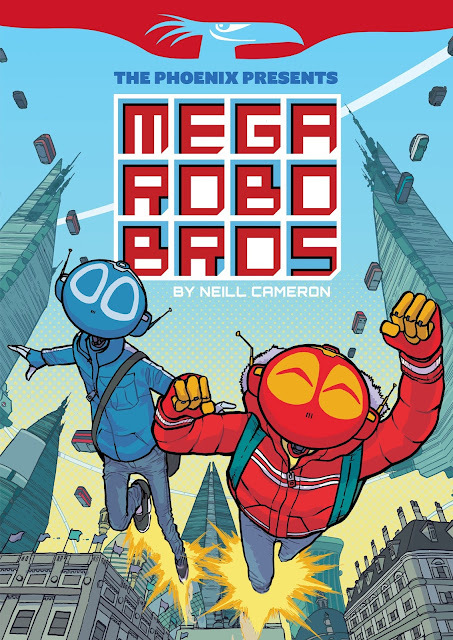 Last week's Phoenix saw the last episode in the current run of my series Mega Robo Bros and I just wanted to take a moment to say thank you to everyone who's said such nice things about the series lately. You know who you are, and it means a lot, and I'm beyond delighted that my little robot dudes seem to have connected with people. Anyway, Alex and Freddy are going to be taking a short holiday now, but they will be BACK SOON. Soon, and often. We've been having some very exciting conversations about these little guys lately, and, basically, they're going to be around for a while, touch wood. I got me some plans for these guys. Anyway! 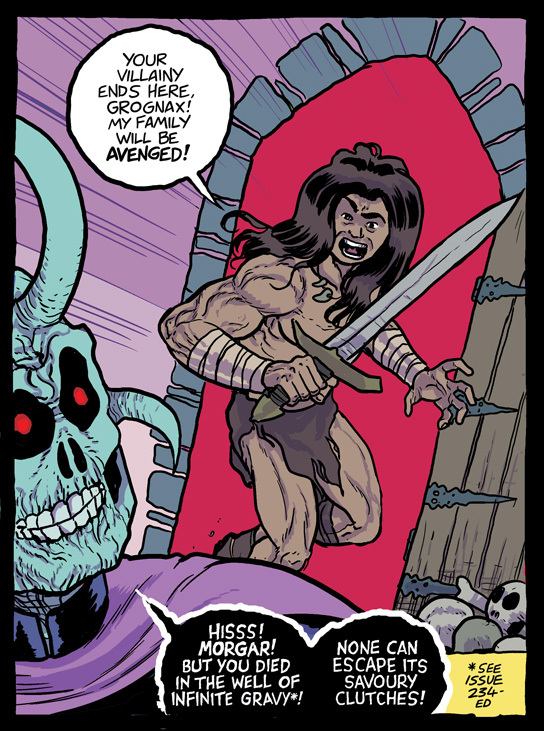 By way of something completely different, this week's Phoenix features a thing I'm very excited about; I had a chance to collaborate with one of my favourite cartoonists, James Turner of Star Cat fame, and I grabbed that chance and drew muscular barbarians all over it. What else? Tamsin! Kate is currently putting together the Tamsin and the Deep collection, and oh my word it is looking glorious. So excited for this book, I can't begin to tell you. In the mean time, I'm starting to write the next volume, Tamsin and the Dark, which I'm afraid I really can't tell you anything about yet. Well I could, but then I'd have to push you down an abandoned mineshaft in rural Cornwall. And I don't think either of us want that. Comics Club update: I've had a few enquiries asking if we're running the weeklong comics course at the Story Museum again this summer, and I'm afraid not - it's a huge amount of work, and I'm afraid I just couldn't fit it in with other commitments this year. I am doing a few one-off events here and there in Oxford over the summer - check out my Upcoming Events page for details. More to be announced there soon! Okay, that's pretty much what I'm doing! I had better go and get on with it all. I was excited to recently read of the discovery of a new dinosaur, Regaliceratops peterhewsi, which has the enjoyable distinction of being a bit like a Triceratops but a bit different, and thus very likely qualifies as the coolest thing to happen in 2015 so far. 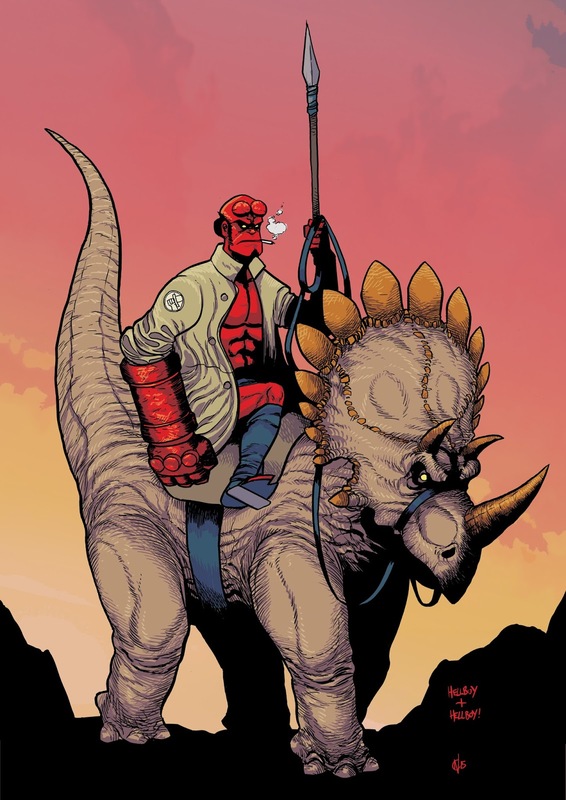 Also enjoyable is the fact that it's discoverers nicknamed the fossil 'Hellboy' - not in fact for anything to do with the horns, but because of some peculiar difficulties in the excavation. Anyway, once I became acquainted with these two pieces of information, a course of action pretty much immediately presented itself. A series of posts from 2014 on the role comics can play in developing literacy skills and engaging with reading and writing. Part Five: Where Do We Go From Here? You can also find the whole series archived as a reading list here, or to download in ePub format (courtesy Sam Hardacre). Neill Cameron is a comics writer and illustrator. He is the author of How To Make (Awesome) Comics, Mo-Bot High, Mega Robo Bros, The Pirates of Pangaea (with Daniel Hartwell), amongst other things. His work can regularly be seen in weekly children's comic The Phoenix. Neill also travels the country teaching comics workshops in schools, libraries, museums and really any public space he can get away with it. Neill quite likes making comics. Support Neill In His Endeavours Why Don't You? 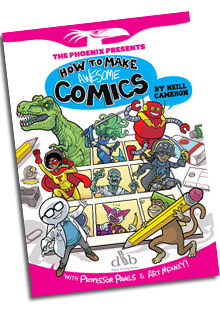 How To Make Awesome Comics by Neill Cameron, available NOW! 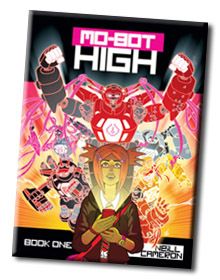 Mo-Bot High Book One by Neill Cameron, available NOW!